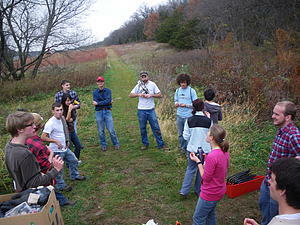 On October 24, 2010, around 25 student volunteers from the Luther College campus came out to cut down non-native shrubs that are invading one of the native woodlands located on the Luther campus. This year's buckthorn blitz was a follow up to last year's very successful blitz of an adjaccent area organized by Dr. Eric Baack. 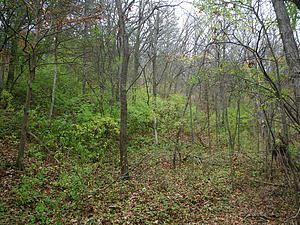 Dense green growth of non-native invasive buckthorn and honeysuckle in a patch of Hickory Ridge Woods before the Buckthorn Blitz, 2010. Same location as previous photo, but two weeks after the Blitz. 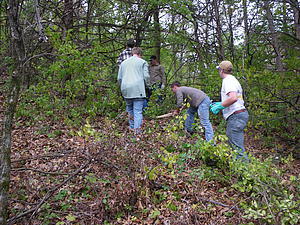 the volunteers drastically reduced the abundance of buckthorn and honeysuckle. This photo is representative of the reduction of the invasives over the entire area covered by the blitz. 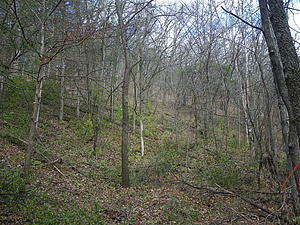 The few remaining invasives are now easily identified and removed after the day of the blitz. 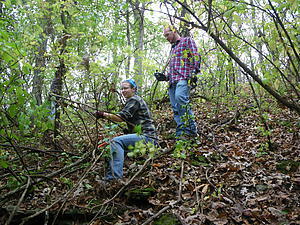 Land stewardship interns Kimberly Stocks and Jake Wittman clearing invasive European buckthorn from Hickory Ridge Woods. Luther College Land Stewardship Intern, Kimberly stocks, and Buckthorn Blitz volunteer, Jake Wittman, cutting down honeysuckle. Buckthorn Blitz volunteers and Dr. Eric Baack closing in on a dense patch of buckthorn. Good company after an afternoon of hard work. Enjoying some snacks and good company after an afternoon of hard work.